Greyhounds are used extensively by hunters during the hunting season in Spain. Known as Galgos in the local language these dogs are exceptionally skilled and have a natural instinct to serve as hunting dogs. 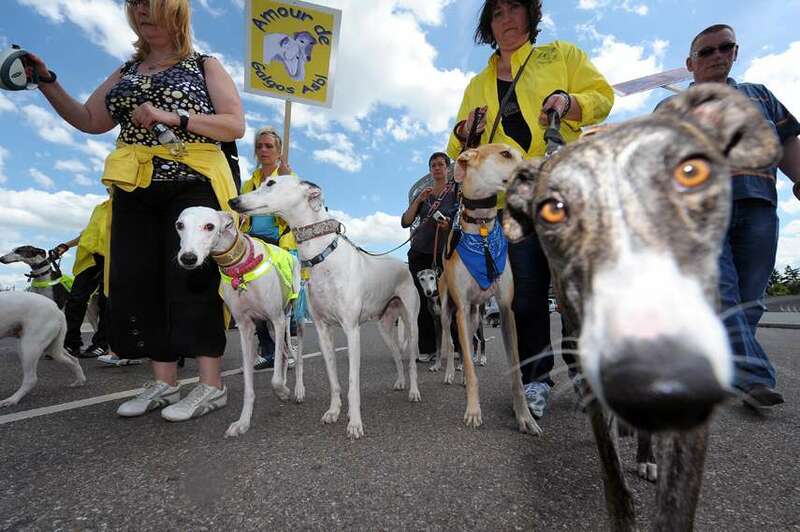 However there is another element to the story of greyhounds in Spain that has attracted international attention, specifically from animal rights groups. It has been a traditional practice of hunters in Spain to slaughter their hunting dogs after the season is over. The hunting season ends in January and the large majority of hunters are not keen on keeping their dogs as pets until the next season. Hence they put an end to their dogs’ lives. There are places in the countryside of Spain where you can to find a large number of carcasses following the end of hunting season. The origins of this practice are unknown. It is known that nobles from the past would display tortured and hanged greyhounds to the public in order to deter the peasants that might be thinking of revolting. Many of these dogs are actually tortured rather than hanged to die instantly. The hunters deliberately tie the noose in such a manner that the dogs can hold themselves up on their hind legs for a couple of days. Once they begin to weaken from hunger and thirst they lose the energy to hold themselves up and fall into the noose thereby suffocating to death. Although this practice has been going on since many centuries it is only recently that it has been brought into the limelight. As it is the Spaniards are condemned for the maltreatment of bulls in the traditional sport of bullfighting but this barbaric act seems to rival or exceed that gruesome tradition in cruelty as well. For some people the fact that the greyhounds are used then later put to death is a very inhumane act. For others however it is the manner in which they are put to death which is a great cause of concern. It is estimated that more than 10,000 greyhounds are hanged in this manner on an annual basis. Hanging is not the only way in which greyhounds are killed in Spain. Many are thrown down abandoned wells or left to wander in the woods to die of starvation. In some instances burnt carcasses of greyhounds have also been found in the countryside. There are more than 30 million people in Spain that engage in agricultural activities and hunting is a primary mode of acquiring food sources for them. The majority of them make use of greyhounds during the hunting season. However the farmers argue that they do not possess the facilities to provide adequate lodging and food for the greyhounds for the entire year and this is why they are killed following the hunting season. The real question then relates to the manner in which they are killed and not necessarily the reason for which they are killed.